This is an awesome ride that can be done as a 40km loop. There are plenty of options for shorter out and back sections of the track too. It's a great introduction to riding offroad. 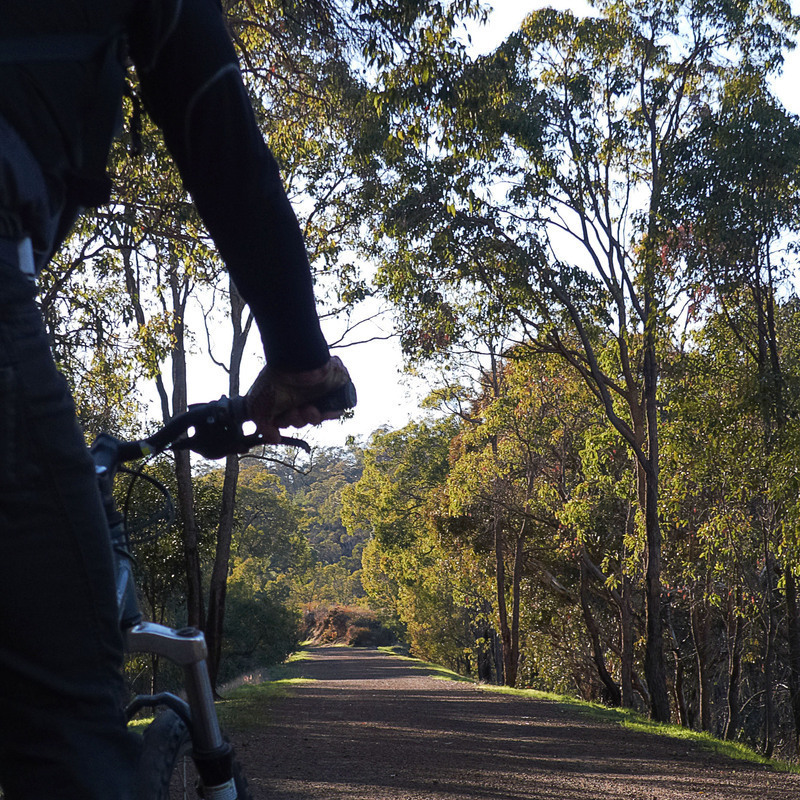 The gravel surfaces for the most part are very good, the trail is wide and, owing to its heritage as a railway line, the grades are very easy going. Just about everything you need to know is in the jolly good brochure and map from the Railway Reserves website. Read on for the missing info. The northern section has a monopoly on the big vistas, including speccy city views. It also has the falls, a much higher density of eateries and, of course, the pretty and dramatic ride through the 340m long Swan View Tunnel - don't forget your lights! No, really, do not forget them, it is very dark in there. The southern part of the loop has none of this but it does boast more consistently even surfaces and is generally less heavily trafficked. Try starting at the Hudman Road Quarry and taking the trail east. This will get you clear of suburbia and you can also have the pleasure of a short side trip to inspect the abandoned quarry which is a few hundred metres north of the carpark. The eastern end from Mundaring round to Parkerville is relatively flat and sports the best access to creature comforts like lunch. It also sports the Mundaring Sculpture Park, Mt Helena Aquatic Centre and the most roads to cross. 1. If you're heading east in the vicinity of Hudman Road Quarry stick to the best used looking sections of path. You have to exit through the carpark entrance; from there you'll see the trail continue across the road. 2. A 1km section of trail running north east from Purton Place is actually a mixture of road (or footpath) and cycle path. 3. If you're continuing on out to Chidlow and beyond you'll need to get onto the Kep Track which is on the southern side of the pipeline at Mt Helena. 4. At Swan View there are two car parks, one either side of Morrison Road. if you're passing through you need to ride out of one, cross Morrison and ride into the other. The trail entrances are adjacent to the covered signboard maps. Trail conditions are mostly excellent. Large sections of the gravel are as smooth as bitumen. The roughest part is paradoxically the most popular, the area between Parkerville and Swan View. The tunnel is particularly rough and potentially dangerous without lights. Watering points around the loop are close to non-existent so make sure you have enough water on board. There are no places to fill up on the southern loop. There are lots of restaurants and cafés around the eastern part of the loop, there are two in particular that are super convenient to the trail; you'll see foodie haunt The Brook Garden as you cross Seaborne St, Parkerville. Mount Helena Tavern just west of Sawyers Road, is a cosy friendly local pub sort of spot with cosy friendly pub meals and pub quality coffee. Both joints will flog you brekky or lunch on the weekend. It sort of seems appropriate to catch the train to ride the rail trail. Midland Station is as close as you'll get. Head east from the station and take your first right on Helena St, then left on Yelverton, which turns into Centennial. Take a left on Clayton and follow that for almost 2km. Once under the Roe Hwy underpass turn left on Rason. Rason turns into Purton and about 0.7 km from the underpass you should find yourself at the trail head near the Bellevue RSL building. You can't miss it, trust me. If you're arriving by car you're spoilt for choice, there are a number of reasonable sized carparks around the trail. If you're doing the whole loop it makes sense to start at the bottom of the hill, parking at either Purton Place next to the Bellevue RSL or at Swan View at the junction of Swan View Road and Morrison Road. If you're doing the highlights start either at the carpark in Glen Forest National Park or at the Swan View carpark. Head uphill from Swan View or downhill from the national park.